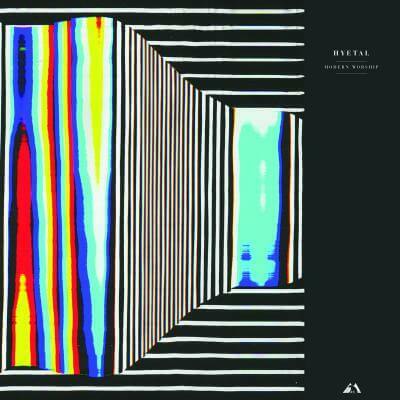 Hyetal returns with his second album ‘Modern Worship’, released 4th of June on True Panther Sounds. After making his name with a series of off kilter dance floor releases and collaborative projects – mutant boogie outfit Velour (with Julio Bashmore), and a joint release with Punch Drunk boss Peverelist, Hyetal released his debut album ‘Broadcast’ in 2011. A step into the unknown for the producer, the album fused influences as broad as dream pop, cult synth scores, Minnesota funk and modern hip hop production into song structures optimised for headphone listening over dance music conventions. ‘Modern Worship’ continues the journey further down the rabbit hole, as a selection of begged, borrowed and stolen analogue equipment rubs up against breathy digital synthesis and sound design. The results are twisted electronic pop songs and soundscapes, with knowing nods to dancefloors across the ages. Percussively a more refined and aggressive record to Broadcast, break-neck drum machines informed by post punk experimentalists and hip hop micro genres are set against melodies conceived from daydreams of childhood nostalgia and imagined futuristic vistas. The record retains elements of the dreamlike soundtrack qualities of its predecessor, with fantasized visuals being key to it’s inception. As Hyetal explains ‘When I’m working on the tracks I imagine the visuals that could accompany it. To me Broadcast was mainly glass and metal, large structures, the reverberant sounds of an empty city, most of it set at night. This one felt more like a view of that city from the surrounding dessert obscured by a red fog, with some day trips to the coast line’. In parts a collaborative record, three songs were co-written with singer & sonic experimentalist Gwilym Gold, while two reintroduce long time contributor Alison Garner of Invada signed shoegaze band The Fauns: ‘Working with Gwilym increased the scope of the album, with ‘Left’ and ‘Four Walls’ he rewrote what I thought were finished tracks. I then deconstructed the original parts to fit his new arrangements, sometimes writing more on top’. As a whole Modern Worship is a deeply immersive, cohesive listen from start to finish, showing Hyetal’s natural ease with the album format. An artist who continues to impress and excite in equal measure, Hyetal proves with ‘Modern Worship’ that he is one of the most innovative producers working in UK electronic music today.